“Our adversaries are not standing still, and so even though we have an advantage and we have a lead, we can’t sit on our lead,” Breckenridge told a hearing of the House Armed Services seapower subcommittee. “We have to continue to move or we do have the potential within 20 years of losing this crown jewel, this advantage that we have in the undersea domain,” he said. China’s submarine warfare power is advancing in both numbers of submarines and growing sophistication and missile capability. Beijing’s submarines currently are “predominantly a maritime, regional undersea force,” he said. “They predominantly use their undersea forces to threaten the presence of our surface ships, to be able to shoulder off the positive, stabilizing influence of our naval forces in an anti-surface warfare dimension,” Breckenridge said. China’s new Jin-class missile submarines are equipped with JL-2 missiles that “will put them into the stage of using the undersea for more than just maritime regional control,” he said. China’s navy is also building conventionally armed, guided-missile submarines, he said. Defense officials revealed to the Free Beacon in July that the first sea patrols of China’s new strategic missile submarines will begin next year, the first time Beijing will send strategic missile submarines far from its shores. Currently, China has three Jin-class submarines each equipped with 12 JL-2 missiles. China calls the Jin-class the Type-094. The National Air and Space Intelligence Center reported in July that the JL-2 will give China for the first time the capability to target portions of the United States from locations near China’s coasts. After deploying at least five Jin-class subs, China currently is working on a more modern version missile submarine called the Type-096. The Pentagon’s annual report to Congress said China has placed a high priority on building up its submarine force and currently has more than 55 submarines, including two new Shang-class attack submarines and four improved variants of that sub. It is building a new Type-095 guided missile attack submarine in the next decade, the report said. The Chinese also have 12 Russian-made Kilo-class submarines, some armed with SS-N-27 anti-ship cruise missiles, 13 Song-class and eight Yuan-class attack submarines. Up to 20 Yuan-class subs will be deployed in the future. While the U.S. Navy currently has the advantage over Russia in submarine warfare capabilities, “they are a close second with regard to their capability and with regard to their shipbuilding industry and the capabilities they’re putting into their new classes of submarines,” he said. 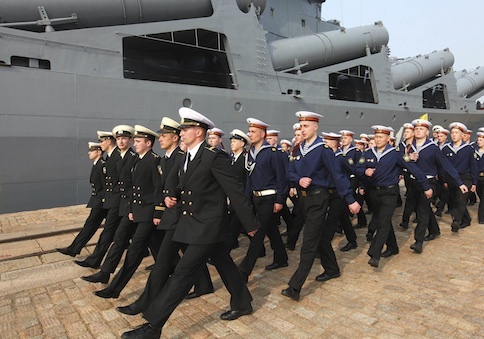 Three Borei-class submarines are now deployed and at least five more could be built, he said. The Severodvinsk class of guided missile submarines will have an “eight-pack” of missile tubes, twice the number on U.S. Virginia-class attack submarines. Tehran’s submarine force of three Russian Kilo-class submarines, one indigenous Nahang-class submarine and an estimated 12 Ghadir-class midget submarines, poses a regional threat. “It is a disruptive force, a challenging force and one that we deal with regard to our ability to project stabilizing influence around the globe,” the admiral said. Rick Fisher, a China military affairs analyst with the International Assessment and Strategy Center, said the “capacity” challenge mentioned by Breckenridge is real. “The Chinese Navy may have up to 53 somewhat older to quite modern non-nuclear propelled attack submarines plus five more nuclear powered attack submarines for a total of 58,” Fisher said, adding that the force could be much larger. “A possible force of 92 Chinese submarines means that U.S. Navy today is facing a very formidable challenge that requires that U.S. submarine levels remain well above 50 ships in order to prevent rapid combat attrition,” he said. By contrast, the U.S. submarine force will decline by 25 percent over the next 15 years as a result of a “gradual consequence of a long list of choices made over many years,” he said. The total number of submarines will drop from 75 to 52, a 30 percent decline, he said. The missile-firing strike payload volume from submarines will decline by over 60 percent as the result of retiring guided-missile and attack submarines, he said. The forward-deployed submarines around the world will decline by over 40 percent, despite building two Virginia-class attack submarines per year, he said. To address the growing need for submarine power with the declining force, Breckenridge said the Navy has four priorities for its submarine strategy. To prevent the worsening decline in attack submarines, the Navy must continue the two-per-year pace of Virginia-class submarines, add a new more efficient missile launch payload module to Virginia submarine, and restart production of torpedoes. Subcommittee Chairman Rep. Randy Forbes (R., Va.) said during the hearing that defense spending cuts are harming the Navy. “It’s apparent to me that the largest threat to the United States Navy is of our own making,” Forbes said of the defense spending crisis. This entry was posted in US Submarines and tagged China, Iran, Russia, Submarine, U.S. Navy. on September 14, 2013 by jasonlockley. A senior Iranian defense industry official announced on Monday that the country has almost completely indigenized building of military submarines. Deputy Head of the Naval Industries Organization of the Iranian Ministry of Defense General Babayee said Iran can now manufacture different types of naval equipments, including submarines. “In construction of military submarines, this organization has achieved more than 90% indigenization now ,” Babayee said. Last month, Iran boosted its naval power in Persian Gulf waters after a new missile launching vessel and two light submarines joined its Navy fleet. 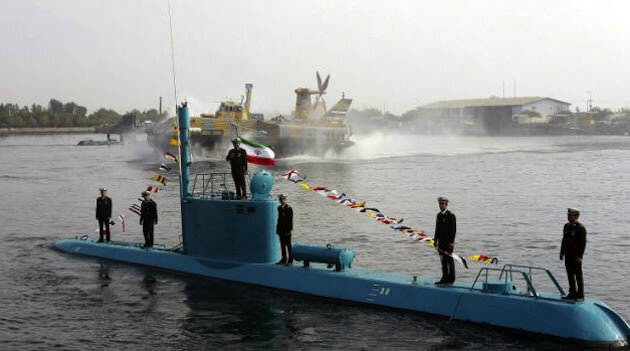 During the ceremony attended by Iranian Navy Commander Rear Admiral Habibollah Sayyari, two Qadir-class light submarines also joined the Iranian naval fleet. All parts of the Qadir-class submarines, including the hull, radar equipment and advanced defense systems, have been made domestically. The submarines are appropriate vessels for different naval missions, including reconnaissance and combat in territorial waters, specially in the Persian Gulf and the Strait of Hormuz which are not wide enough for the maneuvering of large warships and submarines. Meantime, the Iranian Navy tested the operational capabilities of its submarine units on the second day of Velayat 91 naval wargames on Saturday. Spokesman of the Wargames Rear Admiral Amir Rastegari announced that on the second day of the drills, Iran’s light and kilo-class submarines have traversed the territorial and international waters, conducted reconnaissance missions and traced hypothetical enemies successfully. This entry was posted in The world's submarines and tagged Iran, Qadir class on January 1, 2013 by jasonlockley. Two Iranian military commanders disclosed that the country’s home-made sonar-evading submarines enjoy unusual features. “Besides the usual capabilities of the submarines that all people are aware of, our vessels enjoy some subsurface capabilities that are different from the regular features of submarines and no one is informed of them,” Commander of the Islamic Revolution Guard Corps (IRGC) Navy Rear Admiral Ali Fadavi told FNA on Sunday. Also, Deputy Defense Minister for Industrial and Research Mohammad Eslami, whose ministry is in charge of supplying logistical backups including equipments for the Armed Forces, told FNA that “the submarines supplied to the IRGC are of the mid-sized class, given the missions defined for the IRGC Navy”. He said all Iranian submarines are sonar and radar-evading, “since we cannot fulfill our missions today if our submarines are not equipped with sonar and radar evading technologies”. Earlier this month, Iranian Defense Minister Brigadier General Ahmad Vahidi announced that the country plans to equip the IRGC naval force with new submarines. “Production of different types of submarines are on our agenda and naturally they will be delivered to the IRGC whenever they reach their final phase,” Vahidi told FNA at the time, adding that the ministry plans to equip the IRGC Navy with its new home-made submarines. He said that Iran is producing military tools based on its doctrine of asymmetric defense. This entry was posted in The world's submarines and tagged Iran, IRGC, Submarine on December 24, 2012 by jasonlockley. TEHRAN (FNA)- Iranian Defense Minister Brigadier General Ahmad Vahidi said that the country plans to equip the Islamic Revolution Guards Corps (IRGC) naval force with new submarines. “Production of different types of submarines are on our agenda and naturally they will be delivered to the IRGC whenever they reach their final phase,” Vahidi told FNA on Wednesday, adding that the ministry plans to equip the IRGC Navy with its new home-made submarines. This entry was posted in The world's submarines and tagged Iran, IRGC, Light Submarine, Qadir, Submarine on December 19, 2012 by jasonlockley. 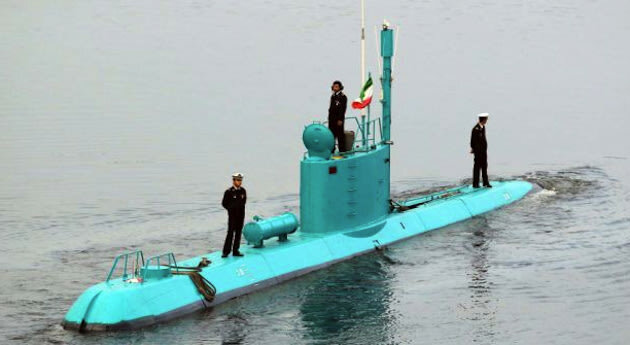 The Iranian Navy’s unusually colorful new Sina 7 submarine (AP)It looks like the Iranian Navy really wanted people to see its new submarine. In a live broadcast on state TV on Wednesday, the Islamic Republic showed off a new Sina 7 submarine that is painted in an unusually bright turquoise blue hue. So, why exactly would any military want to design its ship in a color that can be easily spotted ? TheDaily Mail speculates that the ship’s designers mistakenly chose the color, believing it would help the craft blend in with the ocean’s waters. Launched from Bandar Abbas, near the Strait of Hormuz, the Sina 7 and two Ghadir-class submarines represent the first wave of the country’s “indigenously built” warships, Iran said. “Since the beginning of the Islamic Revolution, we have learned not to ask for help from other countries and stand on our own feet in meeting our demands,” Iranian Navy commander Habibollah Sayyari said during the broadcast. This entry was posted in The world's submarines and tagged Iran on December 7, 2012 by jasonlockley.